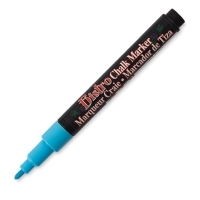 These opaque, water-based, pigmented markers are great for creating chalkboard art on chalkboards, lightboards, dry-erase boards, windows, and windshields. 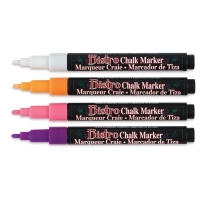 The chalk erases easily from surfaces with a damp cloth. 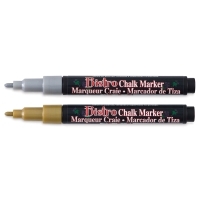 Individual markers are available in 3 mm, 6 mm, or 16 mm tip sizes. 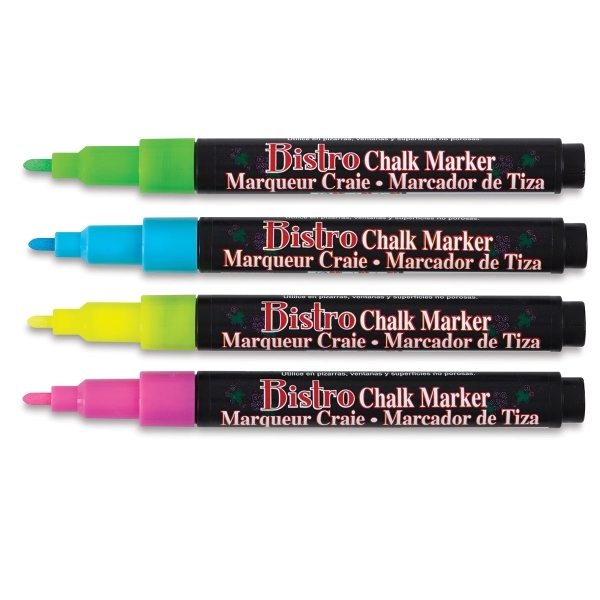 The 4-color sets feature a 6 mm bullet tip in a variety of basic and attention-getting fluorescent colors. 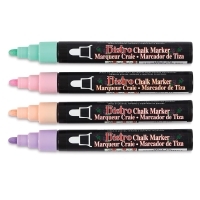 Pastel Colors — Available in 3 mm nib or 6 mm nibs, these sets Include one each of Blush Pink, Pale Violet, Pastel Peach, and Peppermint. Set C — Includes one each of Black, Red, Blue, and White. 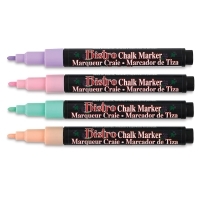 Set D — Includes one each of Brown, Green, Yellow, and Violet. 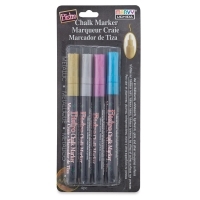 Set A — Includes one each of Fluorescent Pink, Fluorescent Blue, Fluorescent Green, and Fluorescent Yellow. 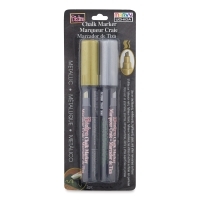 Metallic Colors, Set of 2 — Includes one each of Metallic Gold and Metallic Silver. 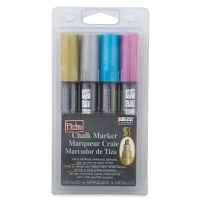 Metallic Colors, Set of 4 — Includes one each of Metallic Gold, Metallic Silver, Metallic Red, and Metallic Blue. Set B — Includes one each of White, Fluorescent Violet, Fluorescent Orange, and Fluorescent Red. Set H — Includes one each of White, Fluorescent Violet, Fluorescent Orange, and Fluorescent Red. 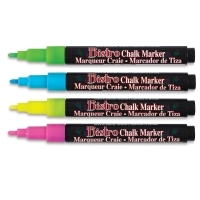 ® Marvy is a registered trademark.™ Bistro Chalk Marker is a trademark.